Want to leverage the full advantage of Microsoft Technology? Hire Windows Developer from Turtlejet at an affordable cost…! The Windows OS is one of the most sophisticated platforms that offer the rich features and usability to its users. 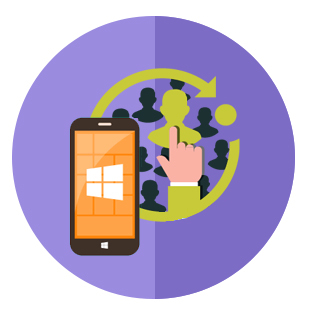 The Windows Development flexes a wide range of business applications and apps designed for the devices you wish for. We offer end-to-end Windows 10 Development Services, Windows Phone App Development, Windows Store Development, Windows Games Development etc. that leverages the best use of this platform to deliver the innovative and unique solution to our clients. Our Windows developers are proficient in every aspect of development and are capable of helping you decide how you can gain the maximum benefit from this platform. The Windows Programmers are well versed with the latest technologies available in the market and work together in-sync so as to increase productivity and deliver the best results. Our programmers can design and develop software applications to work on Windows 10, Windows 8, Windows 8.1, Windows 7, Windows XP or even Vista and depending on the software type you can hire Visual C++ programmers or even.NET programmers. Option of choosing your developer from a huge pool of Windows experts. Contact us at 1-631-897-7276 (USA) or send us an email at [email protected] for a detailed discussion. We assure you our team will provide you complete assistance and would be glad to serve you.